Sales-person-ship matters, maybe more than ever, in these tough times. Yes, even in this age of results-oriented analysis that makes advertising clients view media as a commodity. Why? Because results can’t be forecasted in advance…only observed and learned from after the fact. Since salesmanship matters, interpersonal relationships matter. And the quick and strong way to build interpersonal relationships is in-person sales calls. Most of my clients tell me it is very hard to get appointments. Yet there is a direct relationship between the number of sales calls and sales made. In short, sales calls can be a source of business advantage, if you make it so. So let’s get serious about sales calls. Sales calls are in fact harder to get than 15 or 20 years ago. 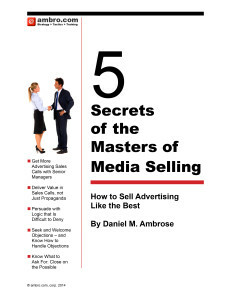 More media companies and more media forms are trying to sell to advertisers than ever before. And the clients and agency people who influence and plan media buys aren’t getting more time in the day. But just because it is hard, doesn’t mean you shouldn’t do it. President Kennedy said we should go to the moon precisely because it is hard. So let’s be clear, first you compete for appointments, then you compete for business. you need to believe that if you are not in the prospect’s office, you are not in the competition…someone else is there pitching against you! The first step to getting more appointments is agreeing it’s a goal. So let’s set an imaginary goal: 15 in-person sales calls a week for a sales person…hard, but possible. Achieving such a goal is simple, come in every morning and work on getting appointments until you have scheduled 3. If you schedule 3 appointments every work day, you’ll end up with an average of 15 per week in the future. And think, what would happen if the outcome of one of your calls resulted in another follow-up call in the future? Then you’d only have to schedule 2 the next day to stay even. Or what if your contact helped you make an appointment with their subordinate, boss, or client? That would help, too, wouldn’t it? For most of my clients, if their sales people had 2 real sales calls a day — 10 a week — it would be an improvement. And increased sales results would follow.